Gasp in awe at the stark beauty of the Makgadikgadi Pan, one of the world’s largest salt pans. With a fifth of the country designated for wildlife conservation, you can be sure of an unrivalled African safari. Activities in Botswana are mostly related to the wildlife. Embark on birding, nature walks and game drives. Or hop on board a mokoro (traditional canoe) to explore the Chobe and Okavango Delta. Find the ideal accommodation that suits your pocket and style – from rustic tented camps to a luxurious safari lodge. In Botswana, you’re spoiled for choice in terms of regions to explore. In the north, you have the Chobe River National Park as well as the Linyanti and Savuti. Around the central parts of the country, you’ll find the famed Okavango Delta and Moremi National Park. Towards the south, you’ll find the desert regions of the Kalahari National Park, home to the local bushmen. All regions are rich in game and diversity. A photographers dream come true. WILDLIFE: Famed for its conservation efforts, Botswana is the epitome of an African success story. With large areas the country unfenced and tourism, it’s the greatest source of income, Botswana is a wildlife haven. SUNSET RIVER CRUISES: What better way to cap off another amazing day in Africa on a sunset river cruise? Relax on board a river boat or pontoon with a drink in hand. 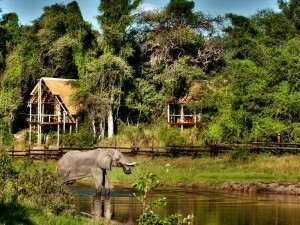 Watch the hippo’s and elephants and listen to the African Fish Eagle call. SCENIC FLIGHTS: Be it in a small charter plane going from one camp to another, or in a small helicopter, see the wildlife and nature from a different angle. See the many river and tributaries and if you’re lucky, herds of elephants. THE PEOPLE: From the warm, friendly greetings upon your arrival in camp, to your knowledgeable guide and the excellent food served by the chefs. The people of Botswana are well known for their hospitality and service. MOKORO: No trip to Botswana is complete without a game viewing trip one one of the local dugout boats. See the wildlife from ground life, whilst propelled along by your guide. If you want to see spectacular wildlife add Chobe National Park to your bucket list. The second largest park in Botswana, it features the largest population of elephants in Africa (about 30 000), prominent pride of charismatic lions, and so much more. Appreciate stunning sunsets over the Chobe River. Experience immense open spaces, vast pans and incredible beauty – the Kalahari Desert in Botswana is a place of extremity and African splendour. Kalahari in Tswana (Kgalagadi) means “great thirst” or “a waterless place”. This desert is covered by red sand without any permanent surface water. Enjoy genuine safari experiences in one of Botswana’s most spectacular wildlife areas. You simply cannot be disappointed when visiting the Linyanti River and Savuti Channel. Explore this unique home to spectacular wildlife endemic to the pristine floodplain-grasslands. The great Makgadigadi Salt Pans are evidence that the Kalahari Desert is not a complete wasteland at all. The Salt Pans are huge drainage areas into which the rainwater pours during the rainy season, bringing them to life. Visitors love the pans in all seasons for their stark beauty. Visit Maun, gateway to the Okavango Delta in Botswana and an essential stopover point for those who need to refuel bodies and minds. Then adventure forth on wildlife safaris into the largest inland delta in Africa. The busiest airport in Botswana, Maun has flights between many international African cities. Come and discover Moremi Game Reserve in the heart of Botswana’s Okavango Delta, considered the most beautiful wildlife sanctuary in Africa. Voted Best Game Reserve in Africa in 2008, visit a wildlife gem that is also the only officially protected area of the Delta. The Jewel of the Kalahari, the Okavango Delta is possibly the most unique ecosystem in Africa. This pristine wildlife region ranks top in the world thanks to the one of a kind wetland system flowing through a desert. See big game from the seat of a traditional Mokoro, dreams are made of this.